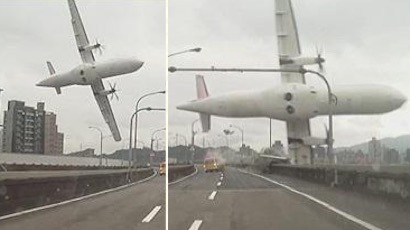 A plane traveling from Taipei, Taiwan to the neighboring Kinmen islands carrying 58 passengers flew directly in front of traffic on a highway bridge today before crashing into the Keelung River. Footage and images captured on an onlookers’s dash cam are so surreal they look like something straight out of a Michael Bay movie. 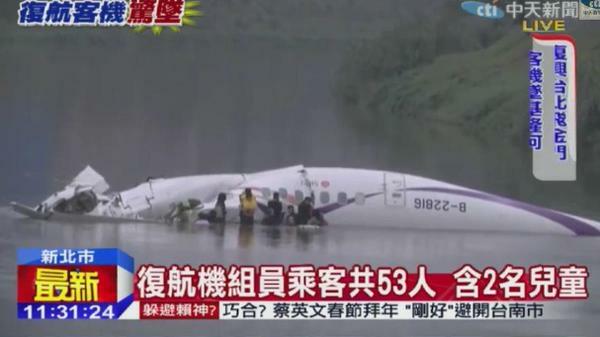 The plane, which turned out a miraculous 15 survivors who stood by the wreckage waiting for rescue, also clipped a taxi cab before plummeting into the river. Twenty six have been confirmed dead so far with 17 more missing.